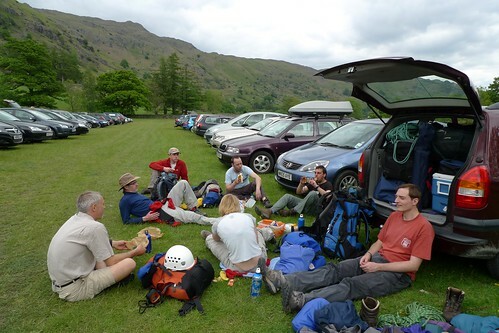 It’s often been said that being a beginner climber is tough – you’ve got no credibility, no-one wants to climb with you, and none of the IMC cliques will let you in and invite you down the pub. Of course it’s totally unfair as the likelihood is that you can burn off 90% of the club members at the wall and you’re a star in the making, so here’s my solution to the problem…. A little knowledge goes a long way if you’re careful how you use it, so here’s a quick guide to some techniques for impressing the gullible in the club (don’t worry, there’s plenty of us), establishing almost instant cred and impressing all and sundry with your levels of competence and experience. Firstly pick your victim – there’s only one real rule here: avoid Martin Hore. All the bluffing techniques I’m about to impart are likely to fail in the face of many years’ experience on the rock and a photographic memory – that and the fact that he’s basically an ex-teacher and everyone knows that they’ve got a sixth sense for detecting little white lies…. It’s important to know at least a handful of crags but if you choose carefully you really need only to memorise half a dozen key points and you can pass as someone with years of experience. The first thing to do is to establish your ‘specialty crag’ –Just like on Mastermind this is the one you’ll claim to be an ‘expert’ on and you’ll have to do a tiny bit of homework for this. Steal a guidebook from some unsuspecting member whilst they’re not looking and flick through the crag guide looking for key words such as ‘industrial’, ‘unpopular’ – basically you’re looking for something small, esoteric (a handy term to remember), and preferably falling down. 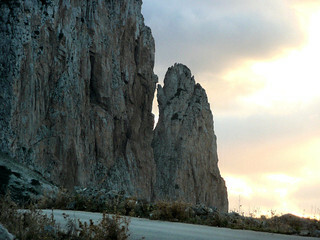 Stars are a real-no-no here – no more than 2 on the whole crag. You’re looking for somewhere that no one has been to or would ever want to go to in a million years. Your line will be that you picked it because you were recommended it by a friend or perhaps by an article on the Internet. Classic choices would be Stannington Ruffs or something from the ‘connoisseurs crags’ section of the Yorkshire guidebook. Get a rough idea of where it is – phrases like ‘about 20 miles West of Sheffield’ or ‘Just East of Manchester’ are suitably vague for peak district crags. If your memory is excellent you can then memorise half a dozen routes that you can claim to have done but there’s really no need as I shall shortly explain. 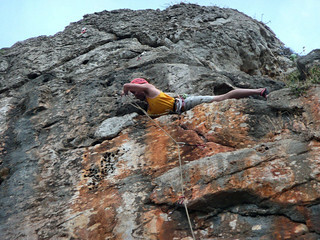 In addition to your specialty crag it’s worth being able to bluff your way in one or two more popular ones. You don’t need much here – the trick with these crags is to choose those that everyone’s been to and get the victim talking about routes they’ve done rather than the ones you’ve invented – really this is like taking candy from a baby as all climbers are suckers for talking about their own routes and just a few encouraging noises and useful phrases can keep the attention off the details of your bluff. The obvious choice here is Stanage (pr. Stannidge). Phrases like ‘That’s at the popular end isn’t it?’ and ‘I hear that’s tough for the grade’ will be your stock in trade here to keep the conversation flowing. like ‘you like this sort of thing, off you go and I’ll see you at the top to help with the belay’. You don’t want that. As I mentioned, you don’t actually have to memorise any actual routes at all. Climbers are a pretty unimaginative lot, and never more so than when naming routes. So here’s a handy crib table that should help out when lost for the name of a route you can claim to have done. Don’t get too cocky here. Claiming to have done ‘Turquoise zigzag wall indirect’ is likely to cause raised eyebrows. 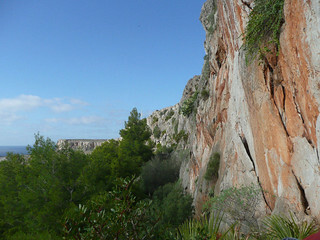 So there you are: instant crag-cred without the hard work. This entry was posted in Old articles on 02/02/2012 by Steve Culverhouse. start time was 2215 so we first had a good meal in a local pub. registered for the event, only about seventy turned up on the day. plus either an anagram describing the place or a visual Rebus-style puzzle. would normally have been quite muddy ground was, for the most part, quite firm. managed to arrive at the refreshment post after us. ahead of the other team. had lost two hours! So, about turn and quick march. penalty. In fact we were now last, with only a few more teams to arrive. This entry was posted in Old articles on 03/04/2011 by kearton r.
this year, for the first time, Norwich. the desert areas. Much easier than a rucksack. The longest, and in my opinion the best, of the films was “Crossing the Ditch”. Tasman Sea to New Zealand. designed by a British chap who had designed one that had crossed the Atlantic. on the emotional and motivational side of the adventure than many of the others. view of someone who wanted to become its first ski guide, even during the wars. session in Hadleigh to attend the show. Road, but with a bit more height. week. If you get a chance to see the Banff Film Festival, do so. 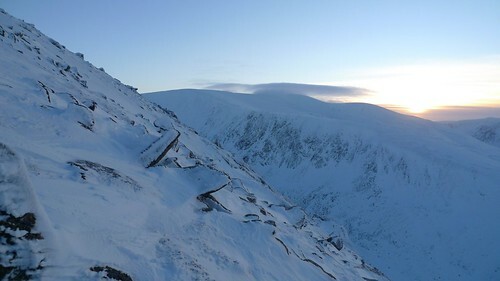 I wish that I hadn’t taken the overnight coach I thought on the walk into Coire an t-Sneachda. Maybe in hindsight it wasn’t such a good idea to go by a method of transport that guarantees an interrupted, uncomfortable night without the benefit of anasthetic. Maybe going for a week of winter climbing in the Cairngorms with a niggling ankle injury wasn’t the greatest of ideas either. Pushing those thoughts aside I pushed on diagonally up the snow slope, unsteadily trying to keep pace without slipping or impaling myself on my own crampons. A few helpful tips on how to improve my footwork from our instructor (Mike) later and I’d made it to the beginning of the day. Still a little shaken, I followed Mike up Hidden Chimney Direct Start. Having never climbed anything harder than grade II before, jumping straight into grade IV was a bit of a shock to the system! Some inventive moves with my borrowed axes were needed – yes you can jam your hammer into a crack, but only if you can live with having the pick pointing straight at you when you make the next move. First pitch over without mishap my fellow instructee, also confusingly called Mike, lead the much easier second pitch. As I was standing around in the cold for the duration, I started the lengthy process of extracting a flapjack from its wrapper whilst wearing mittens. An eternity later I took my first bite: seconds later a lump of ice knocked it straight out of my hand. Finally – time to climb again. I moved up to where Mike and Mike were waiting before leading through to the top, Mike (the instructor) happly soloing ahead and either finding or placing gear up ahead. As we got further up the protection got even sparser so that as I traversed below the cornice that signalled the end the plan became: just don’t fall off . 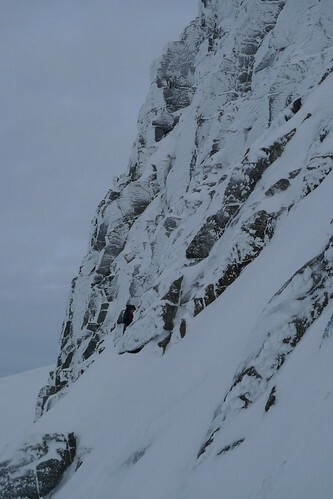 As I cleared the cornice I came to an abrupt halt as I reached the end of the rope. Luckily Mike had the other rope and was able to set up a snow bollard and a bucket seat as I struggled to move into a safer position. Some revision on how to body belay later, Mike made it to the top. After an action-packed first day, we followed it up the next day with a long walk through Charlamain Gap to Lurcher’s Crag. The 1.5hr walk in took a whole 2.5hrs but when we got to the base of North Gully it was worth it as there was loads of lovely water ice. As I’d got a different pair of axes out of stores I was enjoying the benefits of clipper leashes (no axes dangling from my wrists when trying to place protection for example). 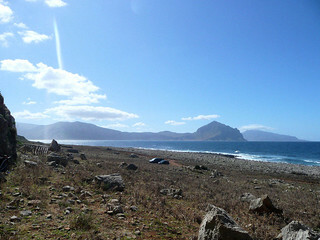 We even had some sunshine! After walking out in the dark we made it back to the lodge in time to bring the remains of the scheduled tea and cake into the evening lecture. Lectures in the evening were all on useful topics like how to avoid getting avalanched, how to navigate when you can’t see, and what to do if you fail to avoid being avalanched. At the end of each lecture it was easy to see who was on a climbing course as we were the ones having difficulty unfolding ourselves afterwards. Wednesday we climbed with the other group on the leading course (to make things less confusing both fellow students were called David), and we spend a pleasent day scittering around on a mainly rock route and getting used to placing our own protection. Now for those of you who’ve only climbed in summer – it’s a bit more involved that just finding the right sized nut to fit in the likely looking crack. First step is to clear away the snow in order to find the crack in the first place. Next you have to scrape the ice away from inside the crack. Then you try to place a #3 nut – it fits! Not so fast – lets just ckeck that all the ice has been removed. Some more scraping and you find out that crack is actually large enough for a #6! Now to make sure that it’s well seated – you hit it with your pick until the nut is completely misshapen. Rinse and repeat. a spare pair of dry mittens are fantastic. 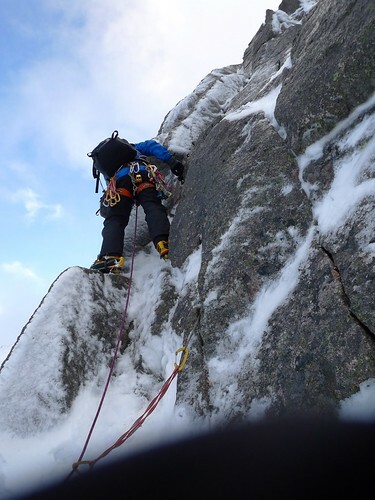 On the last day we focussed more on new skills like placing pitons (not easy if your borrowed axes have extremely bent shafts), revised some older ones like snow belays, and had a bit of coaching on technique when climbing on ice. My ankle decided to tell me that enough was enough on the walk out – but it had made it through the rest of the week. An absolutely fantastic week. Well to be recommended. Also recommended is the Caledonian Sleeper that I took on the way back. More photos from the trip are available here. This entry was posted in Old articles on 02/04/2011 by iana. A fine way to enjoy skiing without taking out a mortgage is to stay in mountain huts or gîtes. Although more basic than 4* chalets or hotels they are frequently more convivial, and food is often better, while expertise and friendly advice is always to be had from the warden or visitors: local, skiing, mountaineering. Access: Train, St Gervais-Martigny line, or bus from Geneva airport. but connected by an effective free bus service and train. black. Excellent snow cover, especially for the beginning and end of season. Access: Train Martigny-Le Châble, ski hire and bubble lift at station. At 2500m, modern refit to a high standard, dormitories: 2, 4, or six beds. Verbier, £25-£35/day at Les Contamines and St Gervais, depending on area. Access to each is by SNCF train and then local bus. This entry was posted in Old articles on 03/10/2010 by robertb. off more than I could chew,” admitted Irish climbing legend Mick ‘met’ O’Phor. of my tether that I realised it was sink or swim,” rambled Mick. “Give me a break Mick,” I interjected. the grateful clutches of ignominious Mick ‘met’ O’Phor. This entry was posted in Old articles on 01/10/2010 by Jeremy Hall. A light but persistant drizzle heralded the morning so Martin H, Steve C, John boy and I headed out along Mickleden in glorious cloud for a spot of ghyll scrambling up Troughton Beck. Some consistant scrambling with an interestingly green section near the end. Now in cloud but with the drizzle still holding off we traversed along the side of Pike of Stickle. Some careful navigation later we were at the base of something resembling the Hanging Gardens of Babylon. Some gardening later, we made it to some good (and wet) rock and then to the summit. The path to the east lead to Dungeon Ghyll. By this time the drizzle had really set in as we scrambled down a path trod by Martin many moons ago. However, the promised abseil had multiplied in Martin’s absence to become three – for even better value! 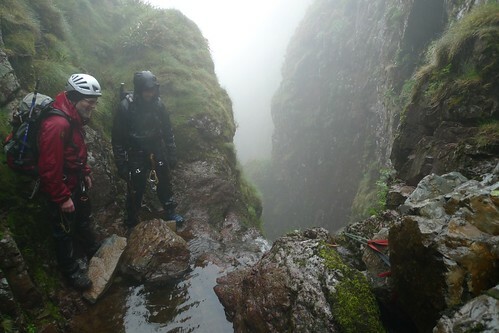 The middle abseil was the longest and wettest, and featured an adjacent cascade to test our abseiling skill. Rejoining the path before any more slings needed to be sacrificed, we made our way to the ODG to finish off the day. 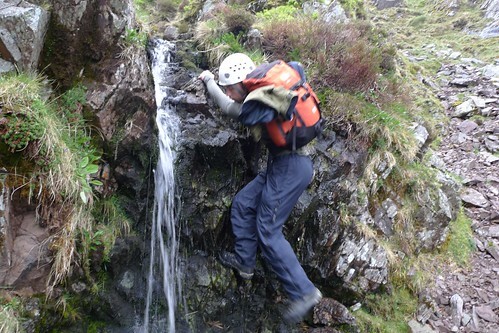 Sunday saw better weather so, with the addition of Martin S and Mervyn, we headed to White Ghyll for some climbing. A promising start with Martin H leading most of Gordian knot. Martin then went on to an excellent lead of “Waste not want not”. On trying to follow, I was suddenly aware of the height part way along the traverse and took a swing. The day was finished off with a successful lead of the first pitch of Slip knot only slighly marred by another loss of confidence seconding the final pitch. On the Monday morning, Martin and Steve headed off for some harder climbing while I headed off to Upper Scout Crag with the main crowd. Jeremy lead the first pitch of Route 1 with confidence, followed by Stuart and then myself. My lead of the second pitch started off with a traverse to the right as suggested by the guide. The lack of polish, gear or holds should have suggested that this wasn’t the route that I was looking for (Jeremy: That’s definitely not HVDiff), but meeting Phil as he lead Zero Route finally confirmed that I’d wandered. A suprisingly social finish to the climb (Phil: Stop taking my gear placements!) made for an enjoyable climb to nicely wrap up the weekend. This entry was posted in Old articles on 01/10/2010 by iana.